Out of the box you’ll find two numbered parts bags, and an instruction booklet. 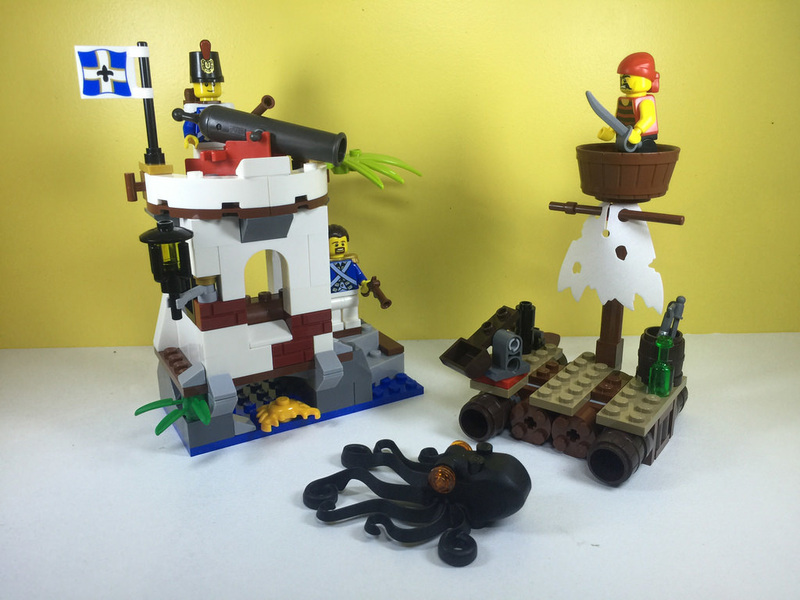 ​This set introduces a couple of new parts, including the fantastic new octopus, and a new bluecoat flag. 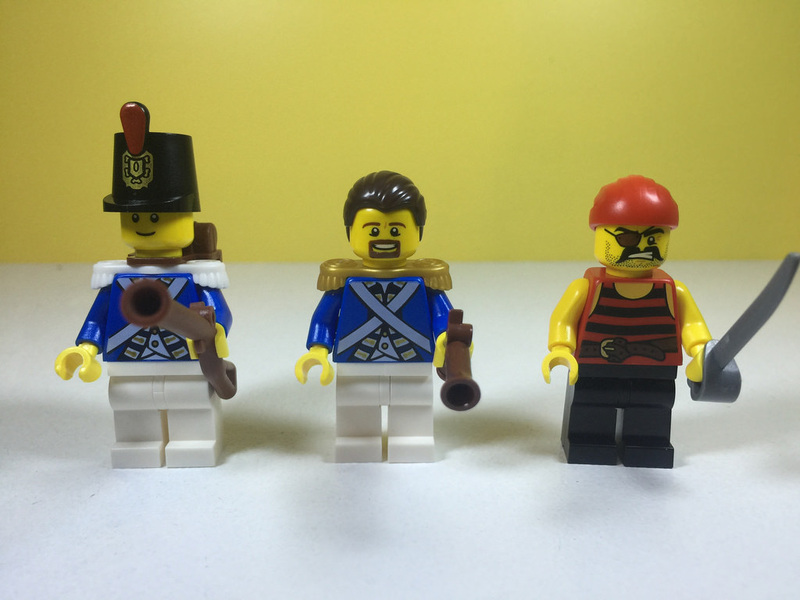 There is also the new elements that have been introduced with the rest of the 2015 Pirates theme, including a whole swag of redesigned minifigures and apparel, and three new dark red 1×2 profile bricks. I can’t get enough of these bricks. They look great in builds, so having three is pretty great. Other good parts include a crab, a transparent green bottle, 1/4 white bow bricks, and four inside corner 2×2 bricks, just to name a few. The build process starts with the first bag, containing the raft. 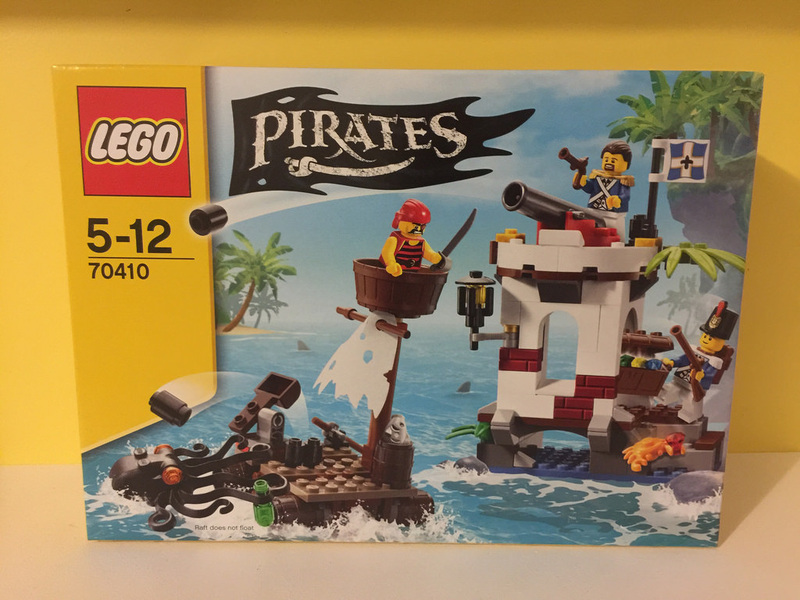 I’m really impressed with the raft in this set. It certainly looks piratey, with four barrels on each corner to make up the floatation part, and some filler in between. The top of the raft has a very simple catapult, and a crow’s nest with a nice and tatty looking sail. It is a little confusing that there is a 2×2 tile in the crows nest, so the pirate doesn’t stay in there. 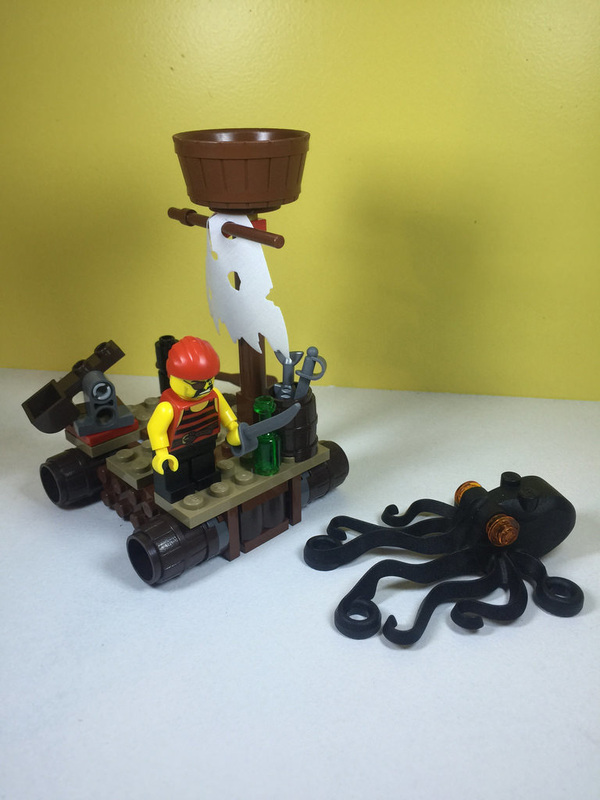 Lots of barrels, a great new 2015 octopus, a crab, lots of nice white parts and some nice minifigures makes for a good amount of elements, plenty of which can be used in a MOC or two. The pull-fire cannon is always a good addition! There isn’t much playability with this set. With the cannon and the catapult, there is a little bit of play, but not all that much. Obviously, kids would need a bit of imagination, which is something that LEGO of course encourages. 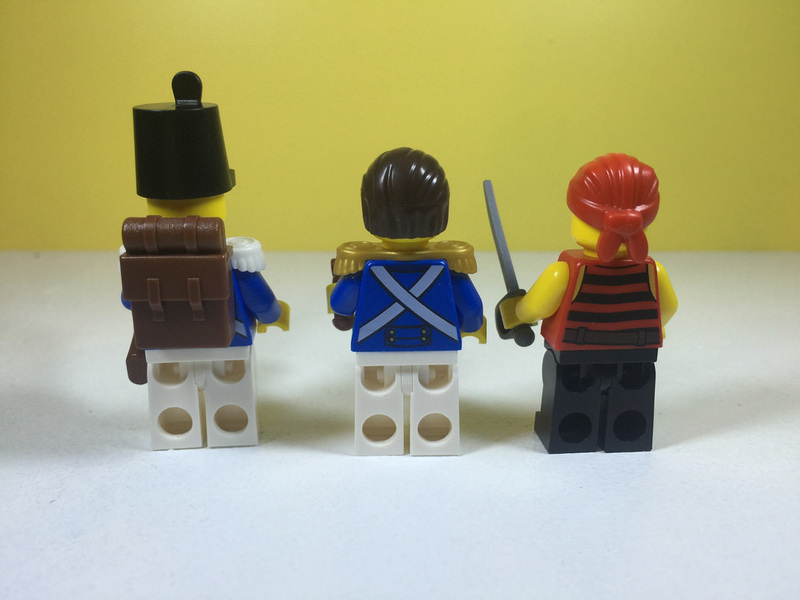 There are a couple of sets in this year’s Pirates theme that suggest joining together. 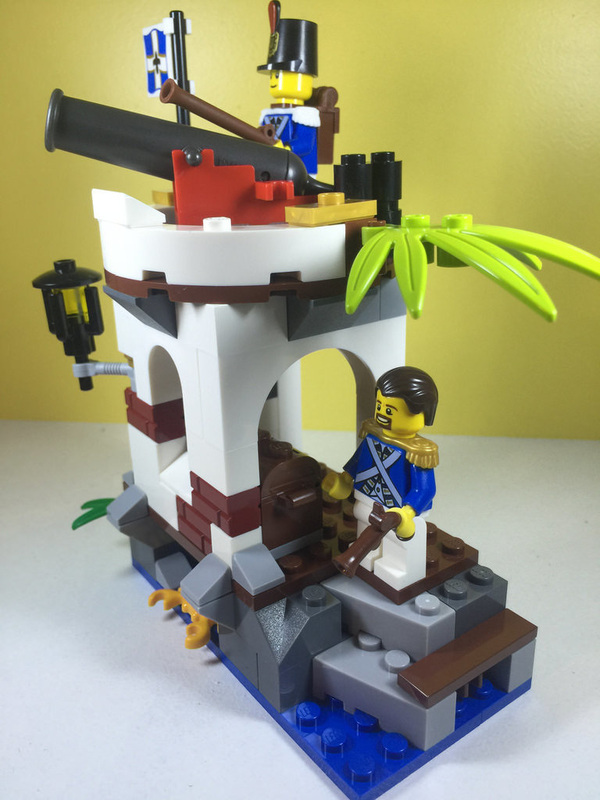 If this set is joined with 70412: Soldiers Fort, it adds more, but as a standalone set it’s not much. The build is very simple, especially for the outpost. Just bricks on top of bricks. The raft adds a bit more, with some SNOT techniques for the sides of the raft, but the crow’s nest is very flimsy, and doesn’t take much to knock off, as it’s only held on with one stud. The outpost is nice and sturdy, and nice and off centre – I quite like the stairs on the right hand side. I really like the design of this one, in particular, the raft. The base is really clever, and looks pretty close to the real thing. The outpost is also really nice to look at, with the contrast of the white and dark red bricks. It looks really effective, although not very safe and secure for the poor Bluecoats! They are very out in the open. I’ve already mentioned the stairs at the right of the outpost. They look really neat, and a clever way to use the angled 2×3 bricks. I think the price for this set is a little extravagant. 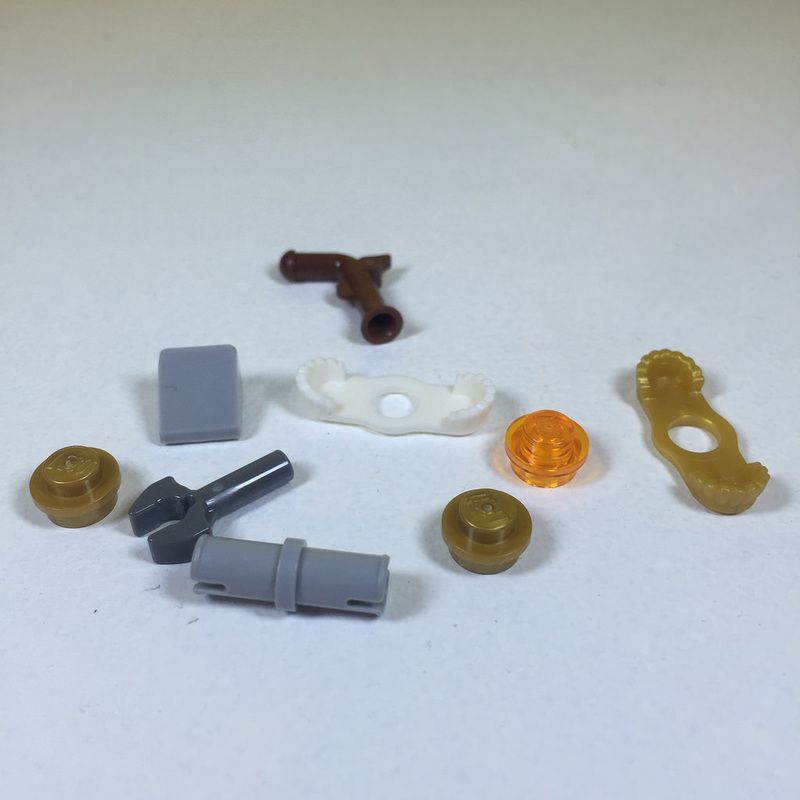 $30 is a lot of money, and for a set that is still small once built for really not many parts is a bit much. The price per element is pretty high, at around 20c, so value for money isn’t that great with this set. 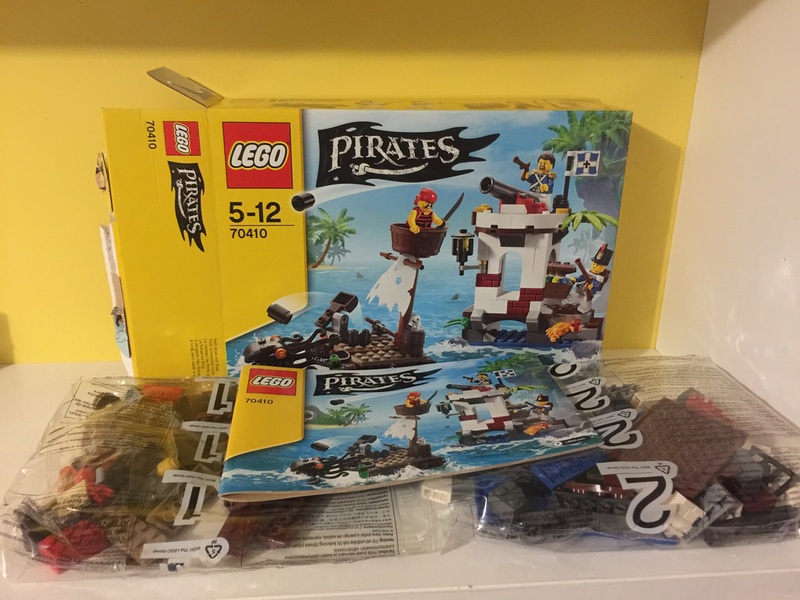 Collectibility is a little better as there are a few things in this set that aren’t in any of the other 2015 Pirates sets, including the pirate (with the red and white horizontal stripes), the ranked Bluecoat, and the octopus. It’s worth picking up the set for that alone! If you are planning on getting the whole range, then of course, it’s a must. For the next few weeks I’ll be taking a break from the standard format of reviews, as I’m currently working through a monster bulk lot of LEGO. I’m sorting it for a fellow AFOL, and there is about 80+ sets in there, plus more bulk goodness. It’s my job to build all the sets and sort the bulk. As a reward for a few months work, I get to keep around 35+ sets! Sounds like a pretty good deal to me! So what will I be writing about? Well, I’ll be talking about the process I use to sort it, and of course the elements and sets I find! There will be sets from all over the LEGO range, from City, to Chima, Castle, Pirates, as well as some of the older, and occasionally little known themes like Exo-Force, Dino 2010, Agents, and more. It’s going to be a fun few months!